Join us at Garbers Church of the Brethren for an evening of personal stories from Loren Swartzendruber and Linda Logan around the themes of peace, covenant community, alien status/citizenship, and neighborliness. We look forward to seeing you there. Youth and youth groups from area Brethren and Mennonite congregations gather for an afternoon and evening of games, service, learning, and worship on the CrossRoads campus of the Valley Brethren-Mennonite Heritage Center. Visit the festival website at SINGMEHIGH.COM for more information and ticketing! 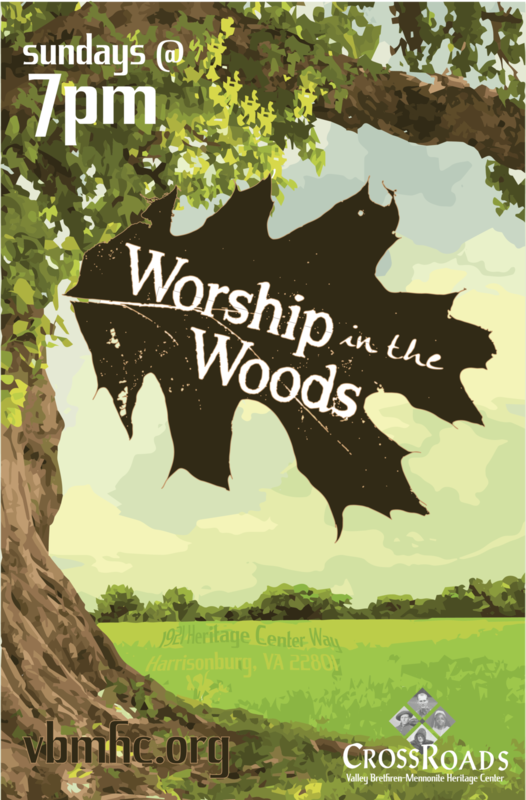 Join us for Worship in the Woods every Sunday at 7 PM from June 17 to August 12 in the beautiful hilltop amphitheater of the CrossRoads campus of the Valley Brethren-Mennonite Heritage Center. Check back for more information about each week's speaker, musicians, and theme! 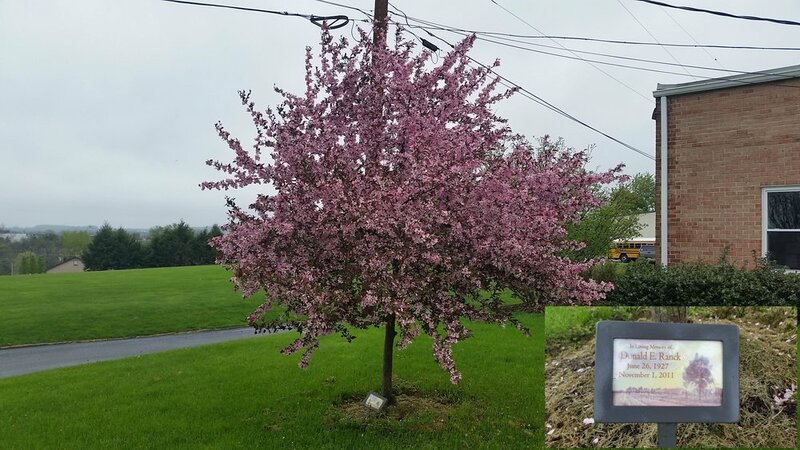 Memorial tree planted at the MCC Material Resource Center in Ephrata, PA in celebration of the life of Don Ranck, grandfather to CrossRoads | VBMHC's executive director, Greg Yoder. In November, All Saint's Day is an opportunity for us to remember loved ones who have passed on from this world. Memorial Day is widely recognized as a day to celebrate and honor men and women who have fallen in service to their country. As people whose primary allegiance is to the kingdom of God, Mennonites and Brethren might find it meaningful to honor and celebrate the lives of those who have gone before us in faith, people who dedicated their lives to building up God's kingdom and seeking God's peace. This Memorial Day we will gather on the CrossRoads campus of the Valley Brethren-Mennonite Heritage Center for a picnic potluck and hymn sing, sharing and songs and stories that help us remember and celebrate the lives of faithful Jesus followers who have gone before us. Come after 4:30 PM to share in the picnic, or come at 6:00 PM to join in the singing. Those coming to picnic, bring food for yourselves and some food to share. Quilting has been an important part of Brethren and Mennonite life for 100s of years. Quilts also play a prominent role in the support of disaster relief agencies for both Mennonites and Brethren. Join us Saturday, May 12, between 10 AM and 3 PM on the CrossRoads campus of the Valley Brethren-Mennonite Heritage Center to quilt, knot comforters, try out various home textiles projects, and fellowship. There will be special quilts and projects for children to work on, as well as quilt-related craft activities for kids of all ages. PLUS - add some stitches or knots to projects that will go for auction at the VA Mennonite Relief Sale and the Shenandoah District Disaster Ministries Auction! Pack a picnic lunch and enjoy the beautiful views of the hilltop CrossRoads campus. Quilters and would-be quilters of all ages and abilities welcome! ADMISSION IS FREE, and donations will be accepted. The Burkholder-Myers house on the CrossRoads campus of the Valley Brethren-Mennonite Heritage Center. The widow Rebecca Burkholder is known to have harbored young men escaping conscription into the Confederate army in this house. Join us for an engaging lecture from Nick Patler, a history professor at West Virginia State University. Professor Patler will share research and reflections from his current work on the Brethren (and by extension, Mennonite) “Underground Railroad” during the Civil War. Prof. Patler is currently working on the compilation of a book based on his research, and he will share his findings and entertain discussion on the topic. Come join us for this discussion of history surrounding young men and communities of faith and conscience dealing with a context that presented immediate and pressing challenges to their faith. A free-will offering will be received to support the mission of the Valley Brethren-Mennonite Heritage Center. THIS EVIL THING is the compelling, inspiring and rarely told story of the men who said no to war; and the men and women who supported them; involving a dizzying journey from a chapel in Yorkshire to the House of Commons; from an English country garden to a quarry in Aberdeen; from a cell in Richmond Castle to a firing squad in France. THIS EVIL THING explores the courage it took to be a pacifist in the First World War, one hundred years ago – following two men in particular : Bert Brocklesby, a young schoolteacher, and preacher at his local Methodist church; and Bertrand Russell - one of the greatest philosophers of his time. With the advent of military conscription in 1916, their worlds are turned upside down. This performance is sponsored and underwritten by CrossRoads | Valley Brethren-Mennonite Heritage Center, Bridgewater Church of the Brethren, Community Mennonite Church, and Park View Mennonite Church, and our gracious host for the evening is Harrisonburg Mennonite Church. The event is free and open to the public. This Lenten season, VBMHC invites you to join in singing songs that turn our attention to the act of following Jesus. What does it mean to truly live as a disciple of Jesus? How do the hymns of our predecessors in faith point us toward a path of discipleship and seeking to follow Jesus? Join us in the log house on the CrossRoads campus for a hymn sing that will be a time of reflection and encouragement for all. A free-will offering will support the mission and vision of the Valley Brethren-Mennonite Heritage Center. Join us in the Log House for an early February Pancake Breakfast! Pancakes, sausage, coffee, hot chocolate, board games, card games, fire in the fireplace, fellowship and community are all part of this wonderful event. If there is snow on the ground, please bring your sleds and slide down our fantastic sledding hill! Breakfast donations will support the mission and vision of the Valley Brethren-Mennonite Heritage Center. Join us for our annual meeting and dinner on Saturday, February 3, at 6:00 PM. A catered meal and input from our director, board president, and guest speaker Saulo Padilla help to kick off the 2018 year for the Valley Brethren-Mennonite Heritage Center. Guests will hear updates from around campus and inside scoops on what is to come in the year ahead, and all attendees should plan to make contributions toward the 2018 operating budget. Admission is $10 for adults, $5 for students age 6 - college, and FREE for children 5 and under.